Why does my cat lash out when I stroke her? Does your cat lash out when you stroke them? Find out why your cat might lash out when you go to give him a stroke. We love stroking cats, and if we have a cat on our lap, we will happily stroke him for an hour at a time. But it looks as if some cats do not enjoy it as much as we do. Cats vary widely in their reaction to human petting. Some won't tolerate it at all even if they show affection in other ways. At the other extreme is the cat that will happily lie on a lap and take any amount of stroking. Somewhere in between those two extremes is a cat that seems to ask for affection, then in the middle of being petted will lash out with teeth or claws. Behaviour experts call this 'petting and biting syndrome' or 'petting intolerance' and it is quite common. To many owners, however, it is mystifying behaviour with often quite painful consequences. Cats that bite or scratch in the middle of being petted are cats in emotional conflict. They want attention but they fear it too. To begin with they enjoy a little contact and love, but after a certain time they get frightened. At this point they bite or scratch in order to bring the petting to an end. Why do cats lash out when you stroke them? It seems that long sessions of petting are not part of natural cat behaviour. Friendly contact between cats is usually short - they will rub against each other or twine tails for a few moments then move apart. Even if they groom each other, long sessions may end in a spat when one of the cats decides he has had enough. In addition to this, some cats that will accept petting will claw or bite if touched on their tummy and hind areas. Research has found that most cats prefer being petted around the head and neck area. With these cats, staying away from their no-go areas will ensure you don't get scratched. The latest research suggests that cats can be very stressed by our affectionate behaviour. Dr Daniela Ramos, a Brazilian vet who is researching what triggers stress in cats, explains: "We noticed from previous research that human factors influenced quite a lot of the stress levels in cats. Many cat owners are very demanding in terms of touching, hugging, putting on the lap and kissing their cats. "Most cats are not inclined to that, so they are stressed by such attitudes. The ones that simply dislike it commonly just escape from their owners. The ones that tolerate it, allow it but dislike it." The result of Daniela's research was physical evidence of cats becoming stressed. 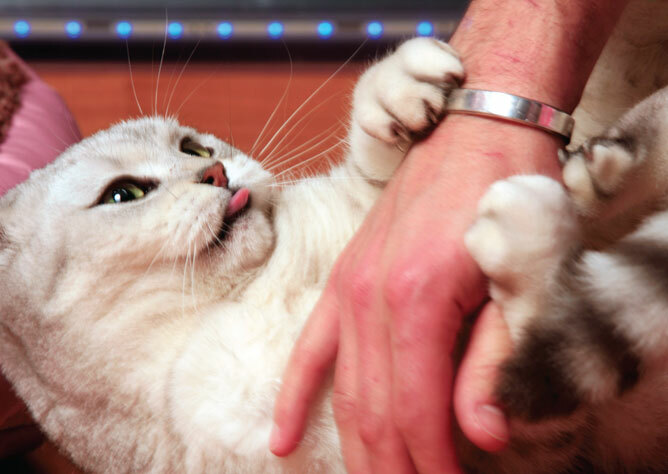 The petting and biting syndrome may be the result of a cat not being handled enough in kittenhood or it may be merely the sign of an innately nervous temperament. If we do not force petting on them, some cats will become more relaxed and allow stroking for longer. We can also avoid getting scratched if we learn to look out for signs of stress such as ears pointing backwards instead of forward, and for the twitching then lashing tail. You may also notice a 'mini freeze' when the cat is absolutely still for a second or two. If you see these signs, stop petting immediately - your cat has had enough. Advice given by Behaviourist Celia Haddon.